I've got my quilting gloves on, and I'm free motioning it! Am I a long-armer now? I'm new to all this long-arm business, so the first thing I did was watch the included DVD, and wind a bobbin. The included bobbin winder has got to be the most intimidating bobbin winder ever! It definitely is not your home sewing machine's simple bobbin winder. It's a separate piece of equipment on a heavy board with the parts anchored to it. It's got a powerful little motor too. All this for a bobbin winder. Threading the machine is a little unusual as you have to loop it around three times on one of the thread guides. I'm new to using a bobbin in a case too, so once I got that loaded, I was ready to give the machine a go. Just a meander with no plan on where I was going. I used the preset maximum speed at 25% for this practice run. My stitches are far from even and it's going to take more practice. Good thing I bought lots of extra fabric and batting just for this purpose. It was a lot of fun to use though. I'm looking forward to more practice time. Thanks Carla! I'm going to try to practice every day, even if it is just for a few minutes. I'm glad to see that you are finally getting some play time with your Sweetie! Have you done FMQ on your regular machine? If so, do you feel like the stitches are easier or better on the HQ? It would seem that your ability to see where you are going, especially backward, would be so much better on the HQ. The local sewing/quilting festival/show is this week-end. I am practicing FMQ, on my current machine, on quilt sandwiches following a design that I have drawn from a template. I will take a couple of the prepared sandwiches to stitch the same design on the HQ and Tiara machines at the show. 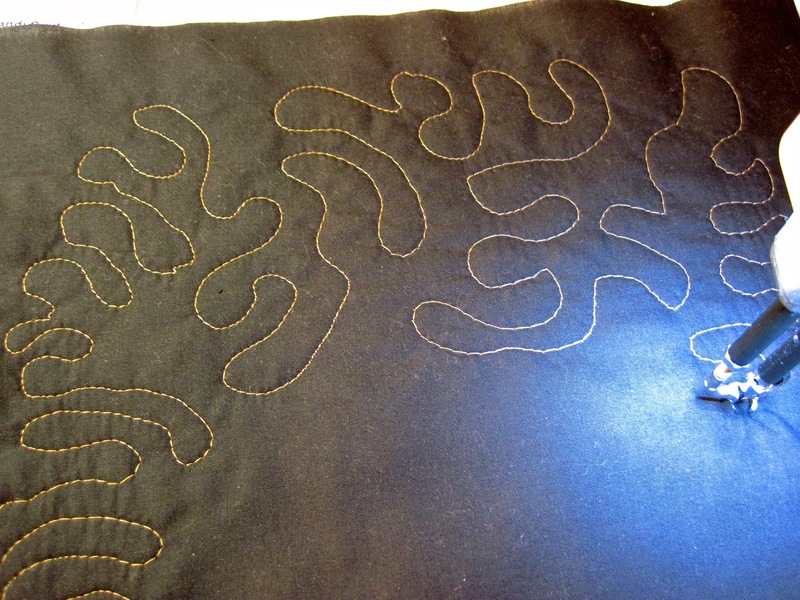 I've taken several classes where I did FMQ on regular machines, but at home, I have always used my walking foot for quilting. Quilting on the HQ was really easy and visibility is good. My unit has the open-toe hopping foot on it which is helpful too. I'll be curious to see how you find quilting your samples at the show goes this weekend. It looks good! Have fun! Oh wow, I can't wait to get mine! ps...I have tagged you in a game of blog tag. Go to http://cathquilts.blogspot.com.au/2012/11/ive-been-taggedonce-more.html to read about it. 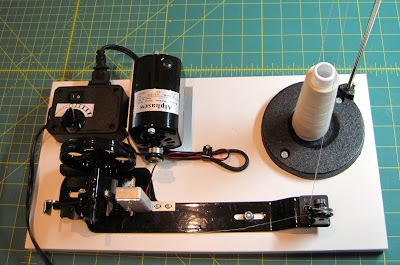 What a neat sewing machine and that is a big contraption for filling bobbins, your stitching looks wonderful! Have fun and thanks for sharing. I'm sew jealous. Glad you're having fun practicing.